Acquired Immuno deficiency syndrome (AIDS) is a serious pandemic public health problem caused by Human Immunodeficiency virus (HIV). It usually breaks down the acquired immune system and leading to develop life threatening opportunistic infections, neurological disorders and unusual malignancies. AIDs can be categorized into four broad headings such as initial infection with virus and development of antibodies, asymptomatic carrier stage, AIDS related complexes (ARCs) and AIDS. From initial infection to development of sign and symptoms are called window period. During the window period, progressive loss of acquired immunity leads to develop a highly susceptible host environment for different pathogenic agents. For the consequences, different opportunistic organisms are harboring in the host and presenting AIDS related complexes like fever, weight loss, prolonged diarrhoea, minor opportunistic infections, and lymphadenopathy. It has been claimed that people who are died in the AIDS are not due to HIV but due to ARCs. Until, no significantly effective medicine has been invented in the world to minimize the consequences of ARCs. Few studies suggested that some herbal medicines have shown significant effect to reduce the morbidity and mortality of ARCs. It is an initial step to assimilate the scientific evidences in the article for drug development to minimize the drastic effects of ARCs. Acquired Immuno-deficiency syndrome (AIDS) is a serious pandemic public health problem caused by Human Immunodeficiency virus (HIV) which breaks down the body’s immune system and life threatening opportunistic infections, neurological disorders and unusual malignancies. In 1986, HIV was called lymph adenopathy virus (LAV). After that, it was recognized as Human T cell lymphotrophic virus (HTLV-type III). International committee was given the new name of the virus as Human Immunodeficiency virus (HIV). Consequences of AIDS can be categorized into four broad stages such as initial infection with virus and development of antibodies, asymptomatic carrier stage, AIDS related complexes (ARCs) and AIDS. From initial infection to development of signs and symptoms are called window period. During the window period, progressive loss of acquired immunity leads to develop a highly susceptible host environment for different pathogenic agents. For the consequences, different opportunistic- pathogenic organism are harboring in the host and develop AIDS related complexes like fever, weight loss, prolonged diarrhea, minor opportunistic infections and lymphadenopathy. It has been claimed that people who are died in the AIDS are not due to HIV but due to ARCs. Until, no significantly effective medicine has been invented in the world to cure the ARCs. Few studies suggested that some herbal medicines have shown significant effect to reduce the morbidity and mortality of ARCs. 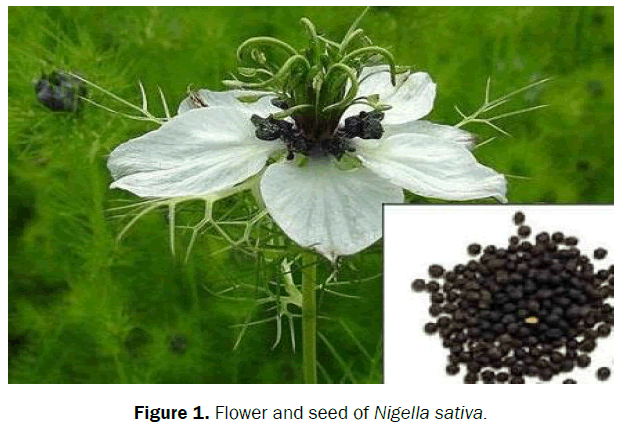 Nigella sativa (black seed) have shown significantly effective against lethal viral infections of HIV. Evidence based study showed that sero-reversion of HIV with the treatment of black seed extract and found no detectable HIV virus or antibodies against HIV in their blood serum both during and after the therapy  (Figure 1). Figure 1. Flower and seed of Nigella sativa. Hypoxis hemerocallidea (African potato) and Sutherlandia are very effective for management of HIV  (Figure 2). Figure 2. Slice of Hypoxis hemerocallidea (African potato) and Sutherlandia. Stephania venosa Spreng (40 mg to 60 mg), Stephania suberosa Forman (40 mg to 60 mg), Stephania glabra Roxb. Miers. 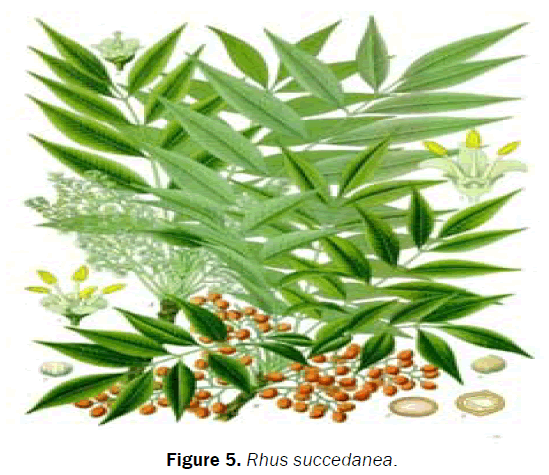 (40 mg to 60 mg), Hedychium coronarium Roem (40 mg to 60 mg), Zingiber officinalis Roscoe (30 mg to 50 mg) and Curcurma amada (30 mg to 50 mg) herbal composition improves the physical condition of AIDS patients and can alleviate or cease the symptoms of most opportunistic infections . 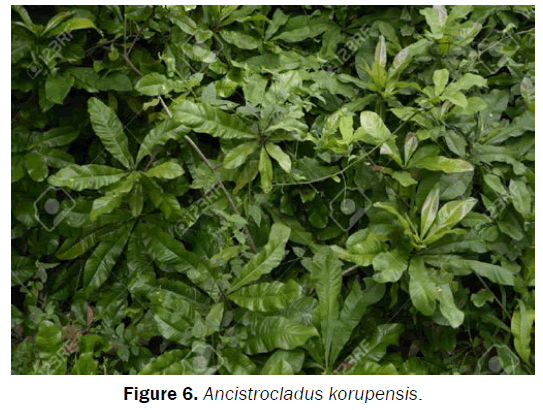 Andrographis paniculata (150 mg/kg; aqueous extracts of leaves diterpene lactones) helps to inhibition of HIV protease and reverse transcriptase, inhibit HIV-infected cells from arresting G2 phase in which viral replication is optimal. Inhibit cell to cell transmission, viral replication and syncytia formation in HIV infected cells  (Figure 3). Galanthus nivalis and Hippeastrum hybrids ( G. nivalis agglutinin, Hippeastrum hybrid agglutinin and Monocot mannose binding lectins) are potent inhibitors that stop the spread of HIV among lymphocytes by targeting gp 120 envelop glycoprotein. It is also found that MBLs has prominent anti-HIV activity  (Figure 4). Figure 4. 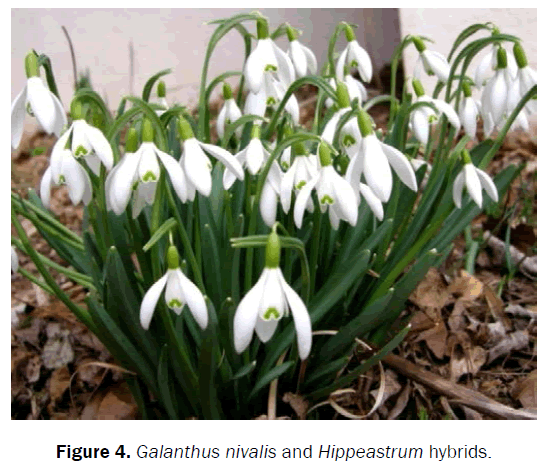 Galanthus nivalis and Hippeastrum hybrids. Rhus succedanea (Biflavonoids, robustaflavone and hinokiflavone) have strong inhibitory action for polymerase of HIV-1 reverse transcriptase  (Figure 5). Ancistrocladus korupensis (Michellamines A and B) have proven Anti-HIV -1and HIV-2 activities by inhibiting reverse transcriptase and at later stages by inhibiting cellular fusion and syncitum transformation  (Figure 6). Allium sativum (Garlic) have potential effect on management of cryptococcal meningitis. It has been shown that concomitant use of garlic can reduce detrimental effects on the plasma concentrations of saquinavir and indinavir . Radix angelica sinensis (root) have shown effective for reducing morbidity, increasing CD4+ count and delaying disease progression [6-8]. Coumarins have shown anti-HIV-1 protease activity [9-11]. Aloe vera (1200 mg leaf juice)- have shown significant efwfect on increase in the T4 cell count (which reflects a boosting of the immune system) and a drop in the P-24 core antigen activity . Momardica charantia (Momardica Anti-HIV protein, Alpha momarcharin and momardicosides ) is having RT activity and inhibits HIV-1 infection . Phyllanthus niruri (Whole plant; phyllanthin, hypophyllanthin, Rapendusinic acid monosodium salt) have shown significant effect on HIV-1 inhibitors and Inhibit HIV-1 RT  . Terminallia chebula (Fruit; Gallic acid, Ellagic acid, Chebulic acid and Galloyl glucoses)- have shown significant effect on HIV- 1 Integrase and Inhibitor of HIV-1 Protease . Glycyrrhiza glabra (Roots; Glycyrrhizin) extract have potential effect on Inhibit HIV induce plaque formation. Punica granatum (Bark punicalin and Punicoretin) have found significant effect on HIV-1 RT activity. It has been proved that nature is having all remedies to combat AIDS and ARCs related morbidity and mortality. We have to search, we have to know, we have to identify and we have to apply appropriate technology to evaluate new molecules, new metabolites or active compounds for reducing the catastrophic effects of HIV and AIDS. It was observed that 63.5% of AIDS patients had used herbal medicine after HIV diagnosis. It is an initiative to provide attention on therapeutic efficacy of herbal drugs for management of ARCs to the scientific communities. Onifade AA, et al. Nigella sativa concoction induced sustained seroreversion in HIV patient. Afr J Tradit Complement Altern Med. 2013;10(5):332-335. Boyd M, et al. Anti-HIV Michellamines from Ancistrocladus korupensis. Med Chem. 1994;37:1740-1745. Visnu K, et al. A review on AIDS and Herbal Remedies. Int j Res Ayurveda Pharm. 2011;2:1709-1793. Piscitelli S, et al. Indinavir concentrations and St. John’s wort. Lancet. 2000;255:547-548. Liu ZB, et al. Treatment of acquired immunodeficiency syndrome with Chinese medicine in China: Opportunity, advancement and challenges. Chin J Integr Med. 2013;19:563-567. Li X, et al. Clinical research of 133 asymptomatic HIV infected persons with traditional Chinese medical intervention. Liaoning J Trad Chinese Med. 2012;4:042. Zhang Y, et al. Research of 284 asymptomatic HIV infected persons with traditional Chinese medical intervention. TCM Res. 2011;24:30-32. Lin PH, et al. Inhibition of HIV-1 Tat-mediated transcription by a coumarin derivative, BPRHIV001, through the Akt pathway. J Virol. 2011;85:9114-9126. Zhao Q, et al. Effect of trichosanthin on suppressing human immunodeficiency virus 1 activity. Journal of Northwest University (Natural Science Edition). 2006;36(1):85-88. Byers VS, et al. A phase II study of effect of addition of trichosanthin to zidovudine in patients with HIV disease and failing antiretroviral agents. AIDS Res Hum Retroviruses. 1994;10(4):413-420. Choudhuri B, et al. Formulation development for treatment and management of HIV-AIDS. Int J Pharm Pharma Sci. 2011;3(1):105-108.